This past weekend at Darlington was a tremendous success. It was perhaps one of the most popular events of the season, and not only for the retro theme of the race, or nostalgia or the track itself. With a new rules package, the quality of the racing was fantastic — so great, in fact, that I think it actually marked a very significant event for our sport. NASCAR got everything right, and maybe without realizing it, gave us a vision for our future. It’s a vision that I want to make sure we all take note of because I think it’s critical to helping the sport grow, and maintaining its level of popularity in the years to come. That all of this happened at Darlington makes it even more meaningful to me because of the track’s history. Harold Brasington, the man behind Darlington Raceway, went to Indianapolis, saw the track, and built NASCAR’s first banked speedway. He had a vision all his own. The track itself has had its ups and downs over the years — at one point, it even looked like it might be shut down — but it came roaring back, more popular than ever before. In that way, the history of the track is kind of like the history of the sport. For reasons I’ll explain later, a lot of drivers — myself included — have been wanting changes to the rules package. That we finally got them at Darlington was almost like a cruel joke given how tough a track it is to drive ordinarily. NASCAR GAVE US A PHENOMENAL RACE WEEKEND AT DARLINGTON. As a driver, your job is to find the limits. That’s how you find speed. You push your car right to the limit. Sometimes, you push your car under the limit and you learn from it. But you don’t really ever know the limit until you go past it. Keep in mind, the limits in a race car are a moving target. You go out there, and you run one lap at 185 miles an hour. Well, when the tires fall off, now you can run 184, and the next lap maybe 183. It keeps changing. If you get a car in front of you and you lose a little bit of the air, that affects the grip. Now maybe the limit is 177. You’re constantly adjusting. With a lot of tracks, especially with the rules package that we’ve been racing for nearly all of the season, if you go over the limit, the car slips and it slides up the track. Usually, two things keep you from spinning out or hitting the wall. The first is the width of the track itself, which gives you time to make a save. The second is aerodynamics, which catch the car most of the time, and you just keep going. At Darlington, both of those things — track width and aerodynamics — are actually working against you. Because the track’s so narrow in spots, you’re running close to the wall because that’s where all the speed is, and where the limit is. If you go over the limit, you hit the wall. There is no room for error, and that’s part of what makes the track such a daunting challenge. Your reaction time has to be so much quicker and precise. So normally, you have to be basically perfect to run well there. With the rule package like the one we ran last weekend at Darlington — which had significantly less downforce — your chance of recovering the car if it slipped was a lot less. So getting the retro rule package at the Lady in Black was like getting ice cream on a 30-degree day. It was like, “Let’s see if you really want this.” Overwhelmingly, drivers said very positive things afterward. I think the feeling is pretty much, “Yeah, we still want it.” (Especially for Carl.) I think a lot of people, fans especially, viewed the quality of racing produced by the retro rules package at Darlington and Kentucky this year as being markedly better. That’s probably not a coincidence. Why is less downforce — the heart of the throwback rules package — a good thing for racing? To answer that question, you need to understand the role downforce plays in aerodynamics, and just how much downforce has changed over the past decade or so. First off, some downforce is necessary. Cale Yalborough made that perfectly clear during qualifying for the 1983 Daytona 500. When he hit 200 miles per hour on Turn 3, lift actually took the car off the ground and flipped it. That’s a good example of not having enough downforce. In the years since then, as more and more focus has been placed on aerodynamics, the downforce on the car has continued to increase. To some degree, it’s because of the influence of IndyCar racing. Indy cars are small and quick, almost like fighter planes, and thanks to tremendous amounts of downforce, the cars dart all over the track, which can be exciting to watch. Stock cars, on the other hand, are aerodynamically more like 747s in comparison to Indy cars, and adding downforce to a stock car has a very different effect on the race track. Just in the time I’ve been a part of the sport, the cars have gone from making roughly 1700 pounds of downforce at 200 miles an hour to about 3200 pounds of downforce. That’s nearly double. At a certain point, downforce goes from being a necessary aerodynamic aid to a crutch. It has changed the way we race, and there’s been a lot of discussion among fans and drivers about whether it’s for the better. For one thing, it’s turned a lot of our races into chess matches where it’s all about fuel strategy and pit stops. Obviously, those are great parts of racing. But when races all come down to fuel strategy, it can become pretty tough to watch. In comparison, we have races — restrictor plate races, for example — where the cars are basically the same and it’s all about parity. In those instances, a mediocre driver can do well or even win simply because of the format and random chance. Both of these outcomes, to me, are inherently dangerous to the quality of our sport. It’s not what most elite drivers want when it comes to racing. When we win, we want to feel that it was because we made a move that very few other drivers could make. The move I made in the Chase last year to take the lead at Chicagoland is one of the proudest I’ve ever had in a race car. That’s the kind of thing we want to be able to do. We want to feel consequential to the outcome. We don’t want the cars to be modified so dramatically that great moves are either impossible to make in certain races, or extremely easy to make in others — so much so that even average drivers can make them. With the Darlington race package, NASCAR changed all that. They made the cars harder to drive. And that made for some great racing. For one thing, we got a lot more self-spin, which is when a driver spins out his car without influence from another driver. With less downforce, self-spins happen more often, which open up windows in a race and change the race’s overall strategy. That usually makes things a lot more compelling to watch, and they’re a lot more credible than debris cautions. If a yellow is hung out with five to go because somebody spun out, it’s generally well accepted within the field that those are just the breaks. Second, we wound up with more comers and goes. With less downforce, a car can alternate between being really fast in a certain portions of the track, and slow in others. That opens up passing, and passing is one of the key attributes of exciting stock car racing. With less downforce, clean air is also less of an advantage. With the current rules package, if you fall back into the pack in a race, it dramatically effects the way you car performs. You go from being a first place car to a 10th place car. As you reduce downforce — and with it, the significance on aerodynamics — that’s not so much the case. You can earn your spot back. It becomes easier to play offense. That’s important because with the current 2015 rules package, it’s never been easier in our sport to play defense. What does that mean? Defensive racing is where a guy in front of you might run a different lane — not because he’s faster in it, but because he knows you’re faster in it, and he wants to steal your air away from you and slow you down. With less downforce and less reliance on aerodynamics, you see less defensive racing. In the 1990s and early 2000s, NASCAR teams invested all their developmental money and engineering skills in advanced aerodynamics, and how they affect a race car. Today, aerodynamics could not be more important. And because of that, when I get into my car, all I’m thinking about is doing everything I can to win. Every day, to compete as a race car driver, I tell my team, “I need more downforce. I need more sideforce. I need less drag.” I want those three things to make me better than the competition. But when I take off my helmet and I think about what’s best for the sport, those aren’t things that I want. What I truly want — as someone who loves NASCAR and wants to see our sport thrive — is for the racing to be as exciting and compelling as it can be. We’re not going to unlearn everything we’ve learned in the last two decades about aerodynamics. But maybe we don’t have to. 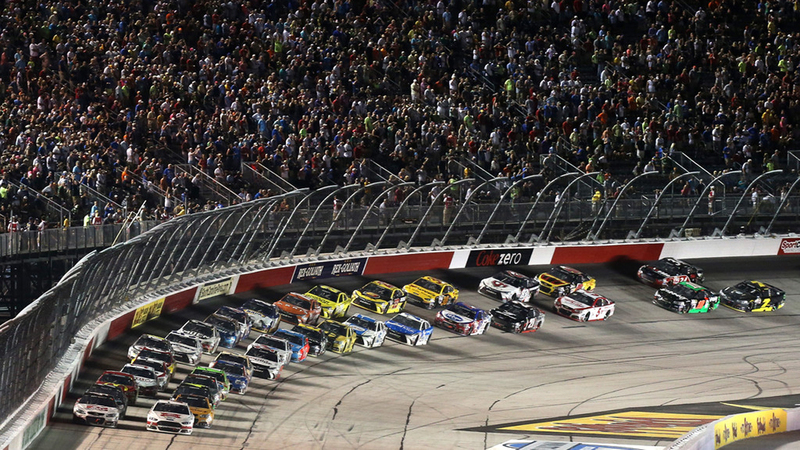 Last weekend, NASCAR gave us an incredible gift, and showed tremendous leadership, too. It gave drivers the race package we’d been asking for, and the result was what many people described as some of the best racing we’ve ever had. I can’t commend NASCAR enough for doing that. It’s a kind of wonderful irony. By taking us back to the past at Darlington, NASCAR may very well have shown us the way to the future.